What happened to our LGBTQI movement? Since 1970, post Stonewall ? We have a quest for gay marriage rights, we have a quest for social security, we have a quest for immigration equality, to serve openly in the military, to not have crimes committed against us because we are gay, we have a quest for employment equality and the list goes on. We are denied many rights in many States under State Law…. 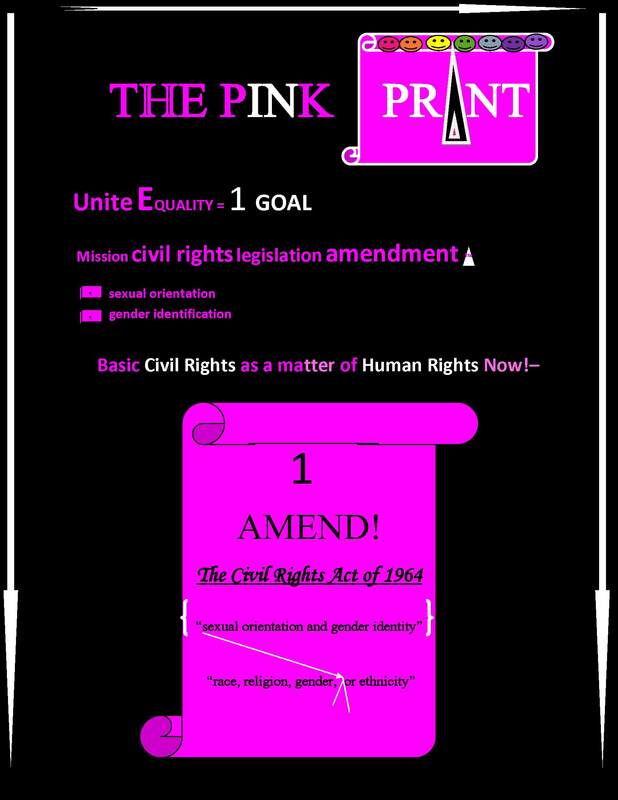 We are denied 1,137 rights on a Federal Level…..
For almost 40 years we have been rallying around organizations, who beg for our money, pay high salaries – some call it GAY Inc. These groups and their employees advance their ownership- on the future of our LGBTI rights. This has resulted into a cannibalization of our movement. What we really want and need is full and complete EQUALITY! Catholic Bishops and Evangelicals impacting Congress and the separation of Church and State. GOOD: Is this any different from USA as usual? How does this all comport? The current environment only precludes piecemeal legislation-and yet we forge the same path to nowhere…. led by the nose of our dollars by a hungry Gay Inc.
Our LGBT organizations have formed mostly around specific arenas of our struggle, which has actually wedged us all into compartments in our activism. This belied a universal message and hence denied us a movement. We have created the very tone that defines us and allowed ourselves to be fuel for fiery evangelicals who have hijacked religion in the name of fundamentalism. Their so called freedom of religion happens to be ours too – it is not owned and in the context of such is an agenda for equality which we should not be denied. The tone the USA public has been hearing and so they are accepting the tone we have set. Our own attitude by way of how we approach our rights- asking for a little at a time – reflects uncertainty and insecurity- it has done little more than make us seem as if we believe we agree with our marginalization. The closest endeavor to universal message is “marriage” and that one is fraught with problems – why? Because it sets us up for the religious arguments which have been working successfully against us and also for the “leave it to the States” excuse also working against us. I believe all is not negative and I do not look back along the path of the past and say ‘oops we made a mistake.’ No, we did not; it was our path and it is done and it has gained a lot for us by way of visibility. There is so much more that is acceptable that was not and the marriage road has given us a good measure of legitimacy and won us many friends. But what I am critical of, is our failure to take stock when we enter crossroads and I believe we are at one right now. In other words we cannot go forward in the same direction, we must choose a left or right turn and then we can forge a new road. We can do something completely different or we can keep doing the same thing. So now it is time to utilize what is emerging from beneath – let us take the new turn here. 1. A CIVIL RIGHTS AMENDMENT to include the word “sexual orientation” and “gender identity,” placed neatly next to the words “race and gender,” we would be setting the foundation for the Mansion to come…. After that our right to equality is solidified and we cannot be denied anything thereafter. 2. AN EQUALITY BILL – a form of omnibus to state that allAmericans shall be treated equally when it comes to sexual orientation and gender identity and effectively repeal all discriminatory law. So find me a champion. Find us a Senator and a member of the House. Who wants to join this movement for full EQUALITY? Who wants to have a one Goal Movement ? For 40 years we have tried the other way and we are still begging for one piece of miserable legislation that a gay friendly President has yet to support to the point of passage. Our lives are no one’s priority – we must stop relying on those who do have a lot to lose – we are gong to have to make sacrifices and do this from the bottom up – so to speak. The leadership can follow. But please leadership, HRC, et al, do not tell us to be patient while you fight for one piece at a time. There IS no such thing as not possible. But it sure is not possible if you don’t not try. Our Movement should be seeking full equality as an ultimate benchmark – short of which we are NOT a movement but rather a floundering minority with spattered leadership! The Apartheid State of Arizona – Precedent for LGBT Immigration Equality in California? Nothing to lose. It’s GO TIME! Great article…tell me what more can I do to help our cause.